Last week I talked about taking and posting Shelfies of students as readers and writers. It has created some really positive energy around literacy in one of my schools. I have been looking for other ways to keep reading and writing on the ‘front burner’ for our students. This week I want to share a few ideas we’ve tried for BOOSTING BOOKS! Several of our schools recently hosted Scholastic Book Fairs during parent teacher conference week. Some teachers really try to promote this for students and parents. They take tours of the book fair and whet their students’ appetites for all of those crisp new books waiting to be picked up and read. Teachers pass out the catalogs to take home and often go through them with the students first to help them make choices. A few teachers and I also decided to post book recommendations right on several of the books in the book fair. 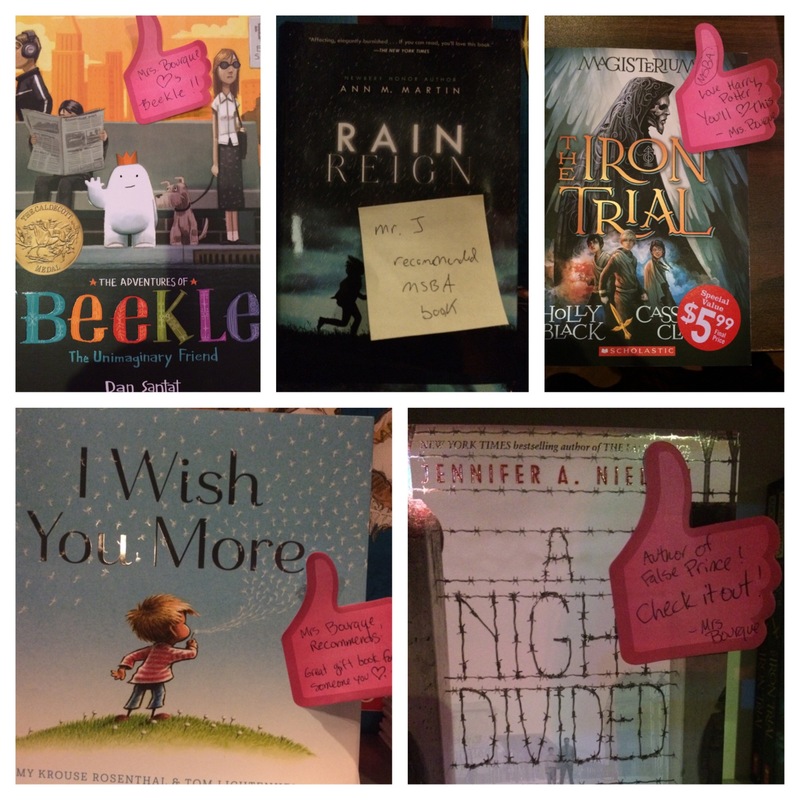 We took sticky notes and wrote comments such as “Mr J Recommends”, “MSBA (Maine Student Book Award) Selection”, “Great gift book”, or “From the author of The False Prince-check it out!” This notes will linger with the books and allow students and parents to see which books their teachers like or recommend. Since many of us choose books based on recommendations, we thought this would be a fun way to generate more interest. I know not every student can afford to buy books from the book fair, but all students can and do get books free from our libraries. I wanted to generate some interest and excitement about books in this venue as well. 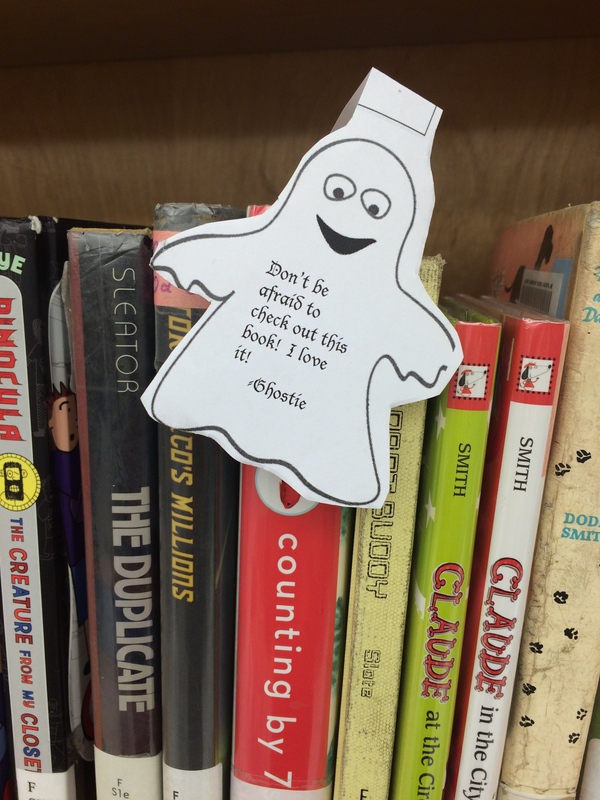 I created some cut out paper ghosts with comments such as “Don’t be afraid to check out this book! I love it” or “This book is dying to have a reader! Check it out! 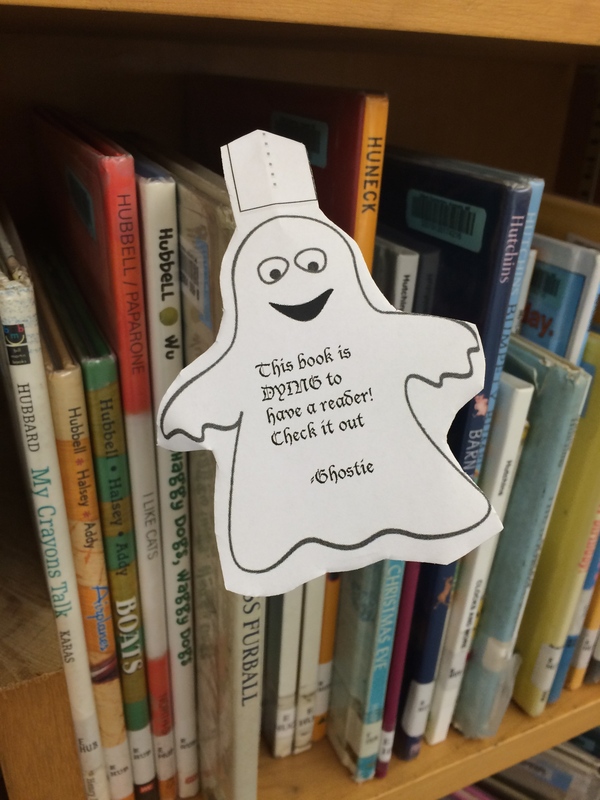 I tucked these library ghosts into books that I thought kids might really enjoy. I know books that are face out, rather than spine out, often get checked out by students. I wanted a way for books to POP out and invite a reader to notice them. I got an email from one of our librarians saying the “ghostie” books were flying off the shelves! I’ve already created turkeys for next month’s library book boost. I figure I can set a new theme each month and see how it goes. Maybe other teachers or even students will pick up on the idea and begin anonymously recommending books to others. I’ve got some other Book Boosting ideas that I will roll out in the next few weeks or months. The idea is to keep interest fresh and exciting. I know that once readers get into some of these books, they’ll be hooked-it’s just getting them connected with good books is the first step. This month I will be presenting at NCTE 15 with some of my favorite authors of middle grade literature-one of them is Linda Urban. She writes with such amazing voice that I find myself wanting to read her books aloud (even to myself)! 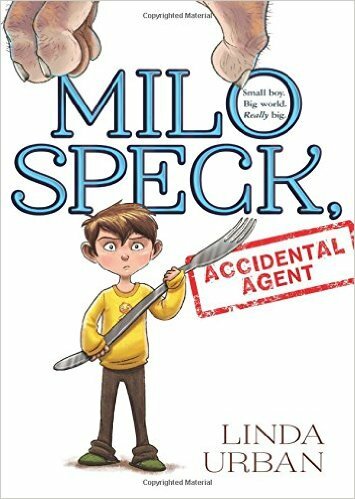 Her latest book Milo Speck: Accidental Agent is such a treat! Milo finds himself transported to Ogregon-a world of big ogres (but small brains!) when what begins as a quest for a missing sock becomes an adventure he hadn’t anticipated. I’ve heard this story compared to those of Roald Dahl, and I’d have to agree. Silly fun, villains to ‘Boo’, and a hero to cheer for make this a great read! Check it out! !